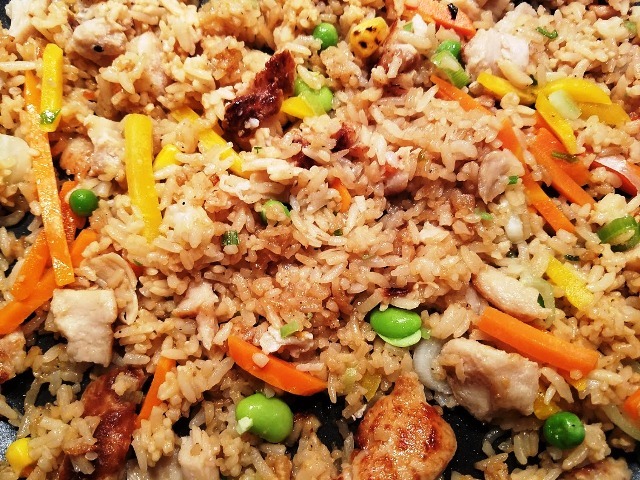 Ling Ling Yakatori Chicken Fried Rice delivers superior flavor for an easy weeknight meal. Now that it is fall, we have been super busy with traveling, reunions and work projects. I don’t even know where the time goes! 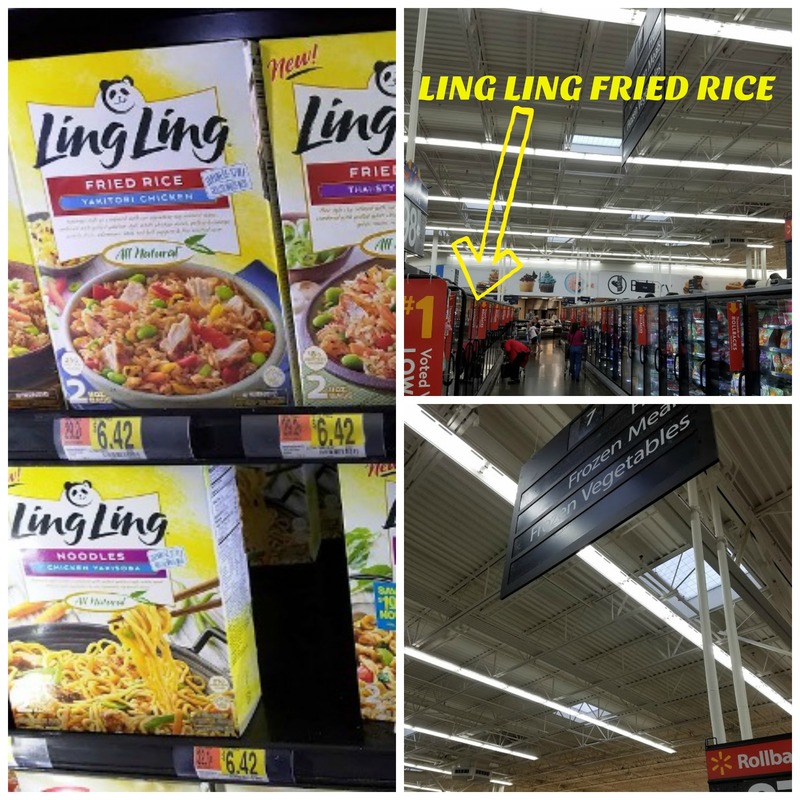 To make life easier on myself, and to avoid calling for take out, the last time I was at Walmart, I picked up some boxes of Ling Ling Fried Rice. 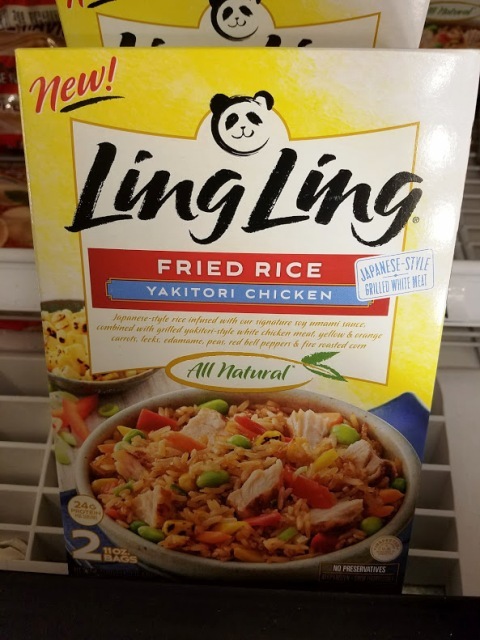 I have tried some of Ling Ling’s other products, so I thought I would give the Fried Rice a try. The first variety that I tried was the Yakitori Chicken. My family loves Chicken Fried Rice, so I knew that they would be excited to have this with their dinner. 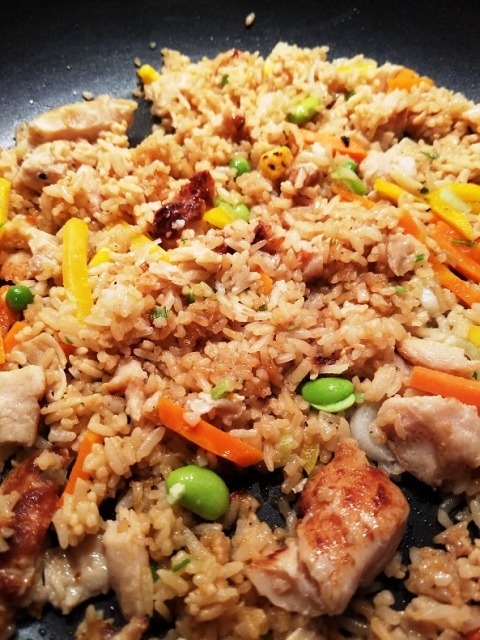 There are two ways that you can prepare the Yakitori Chicken Fried Rice. This time I made the rice in a skillet, I just love that golden crunchy way the rice gets. But when in a time crunch, there is always the microwave method. I had a chicken that I bought on sale that I roasted in the oven. Season the chicken with spices and bake in the oven covered for 2 hours, or until the pop up thermometer pops up. This recipe makes the juiciest roasted chicken! 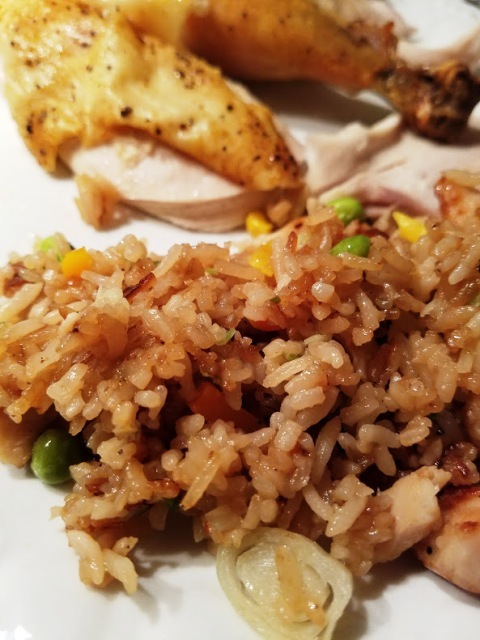 I served my family baked chicken with Ling Ling Yakitori Chicken Fried Rice. 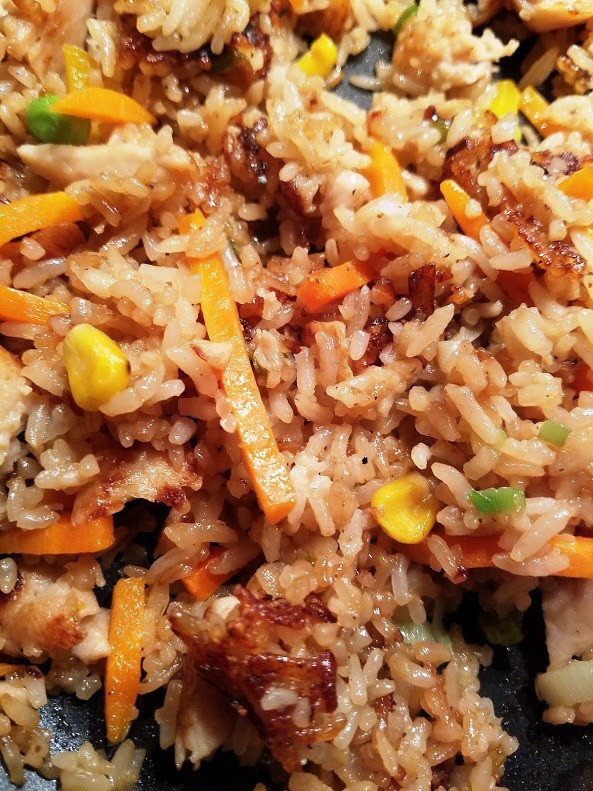 I was impressed by the full flavor of the Yakitori Chicken Fried Rice. Doing my research, I found that the Lin Ling cooking process uses the infusion cooking method. This means that each grain of rice and noodles is infused with the Ling Ling signature sauces so that there is incredible flavor in every bite. I really can’t taste the difference between Ling Ling Yakitori Chicken Fried Rice and my restaurant favorites. Actually, I liked it Ling Ling even more because the fried rice with the extra veggies included. When eating Ling Ling Asian Entrees, staying in will feel like you are at your favorite Asian Restaurant! I am excited to share a giveaway with you! I am sharing a COUPON with you! Coupon offer: $2 off any box of Ling Ling Fried Rice, Noodles, or Dumplings at any retailer where you will find Ling Ling products. 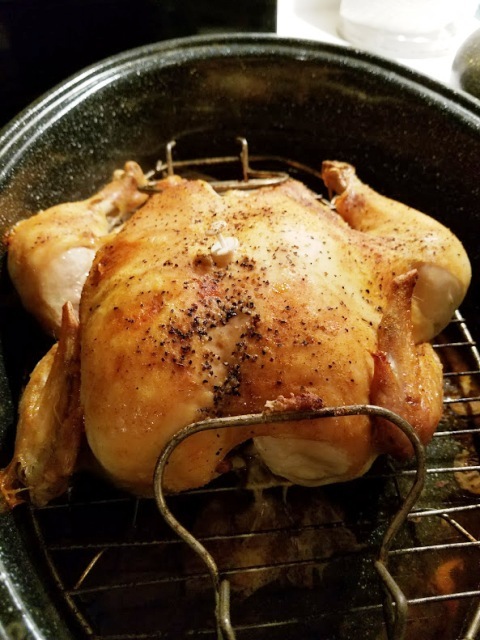 Easiest and juiciest whole roast chicken! Place chicken in a roasting pan, preferably with a rack, and season generously inside and out with Lawry's Seasoning Salt and fresh ground pepper. Sprinkle inside and out with onion powder and garlic powder. Place 3 tablespoons butter in the chicken cavity. Arrange dollops of the remaining butter around the chicken's exterior. Cut the celery into 3 or 4 pieces, and place in the chicken cavity. Bake covered for 2 hours or until the instant thermometer pops up. Remove from heat, and baste with melted butter and drippings. Cover with lid or foil, and allow to rest about 30 minutes before serving. Tell me, what variety/flavor Ling Ling Fried Rice, Dumplings or Noodles would you and your family enjoy most? Leave the answer in the comments below! I would love to try the Bibimbap beef ! I can’t wait to try that flavor too! Yakitori Chicken looks delicious. I think we’d like to try that one first. Bimbimbap Fried Rice would be first for me!